It’s too hot to cook. It was 96 degrees F today in New York City! Here are a couple of non-labor-intensive dishes. Above is a pre-made, but very fresh, salad mix from a purveyor at the Union Square Greenmarket whose name escapes at the moment. 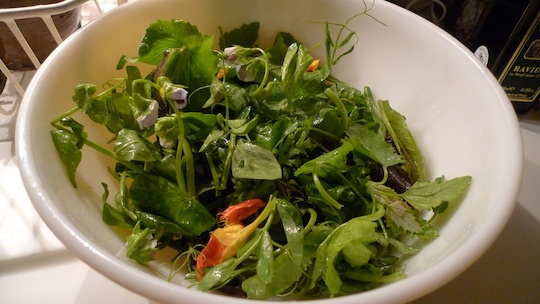 It includes snow pea leaves, a variety of bitter greens, and flowers. I tried to do as little damage as possible with a small amount of good olive oil and red wine vinegar. 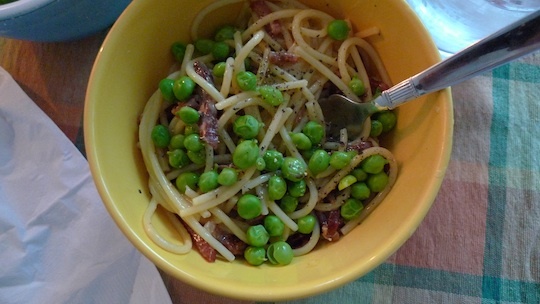 The illustration below shows Ruth Rogers’s very simple carbonara from her River Cafe cookbook. It uses 3 egg yolks beaten into 60 ml double cream, and emerges flawless every time – much lighter and creamier than Marcella Hazan’s version. I enlivened it with some freshly shelled peas – boiled, drained and sprinkled on top at the end.